On Saturday, Zach Bell became the first ever Canadian to win a World Cup title on the track. 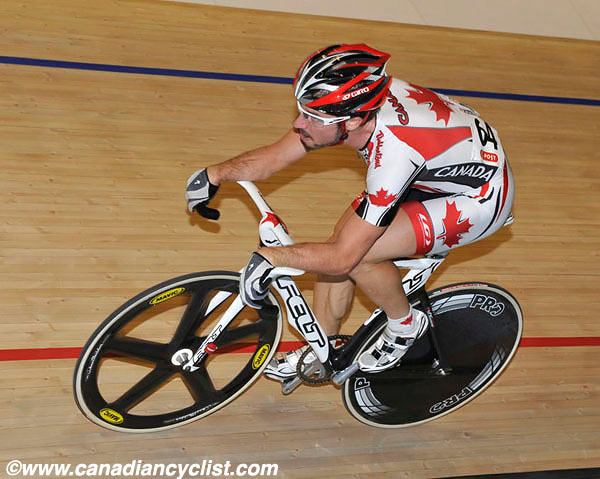 Bell won the men's Omnium title despite not attending the final round in Manchester, England. He won two silver medals and a bronze medal in the four event series, to win the title by one point over Shane Archbold of New Zealand. We spoke with Zach today from his home in Vancouver. Canadian Cyclist: You didn't attend the final event; did you still think you had a chance to win the title? Zach Bell: I knew the possibility was in the cards. Ed [Clancy - Great Britain] was the only one who could really catch me. I was a bit surprised when he didn't start at home [Manchester], but I knew that they [Great Britain] were going to want to focus on the Team Pursuit, and I guess he had to make a choice. CC: You are the first Canadian ever to win a Track World Cup title; how does that feel? ZB: It's pretty exciting. I have a little joke with Tara [Whitten], because she always rides [the women's Omnium] a day after me, that now I've actually beaten her at something! I think what it [the World Cup title] speaks to is the depth of the [Canadian] program that is being built now, that's a huge accomplishment. At the Worlds, if you can get it right on the day, then an individual can win, but the World Cup involves a program all year, so this speaks to our program. CC: When we spoke earlier in the year, I asked if it was a tough decision to possibly give up the chance of winning the World Cup by skipping the final event. It work out okay, but it was really tight; did you start to second-guess your decision at any point? ZB: No, the priority has been the Worlds, for sure. Richard [Wooles, national coach] has been really good at keeping me focussed. The Worlds has usually been a hard one for me, and it's the one that we really want to try and get right this year. CC: You didn't go to Europe with your SpiderTech team mates because of preparations for the Worlds. What have you been doing? ZB: My training has been going pretty well, I've just finished some road work, training with some old team mates and other pros down in Santa Barbara [California]. I'll start easing into the track stuff here in Burnaby first, and then down to Los Angeles in March for final prep. CC: Where are your strengths in the Omnium? It always seems to me that you do well in the Flying Lap, but not as well in the mass start events. ZB: The only mass event I really struggle with is the Elimination, but adjustments have been made and that is getting better. I've always been good at the Flying Lap, and I think that I can build a foundation for the podium in the timed events. I can usually manage to be consistently top-five in the timed events, and then in the mass races finish as close as possible to my rivals, to not give too much away. I don't know that I really have any weaknesses, but I'm trying to improve my starts for the Kilo and the Pursuit. CC: Your team [SpiderTech p/b C10] just had their first European race last weekend, and they are off to a pretty good start. ZB: Yeah, Ryan [Anderson] did really well. He sometimes seems like he is going to come off three kilometres into the race, but 100 kilometres later he's the guy who is still in there.